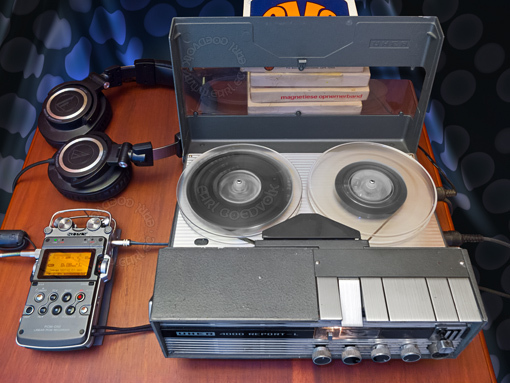 I'm currently digitizing the audio tapes my dad recorded with his two 1961 Uher 4000 Report-L recorders, one of which is displayed in the photo below. Besides other Uher items I have his second 4000 and Uher Mix-5 mixer, also in perfect working order. I used this equipment many times myself while growing up, even for one of my dad's albums. Of course, in addition to a long family history this Uher also has incredible German engineering, that distinctly warm analog sound, and a built-in speaker second to none! Best machine: the Uher 4000-L. It should be, it costs $440 - more than twice as much as the nearest runner-up. But it's worth it if you need or want really fine production. Tapes made on the Uher equal or surpass in quality those made on the finest nonportable home machines and many professional recorders, in our judgment.